This is a psychological illusion where your upbringing and culture is what decides what you interpret from this image. 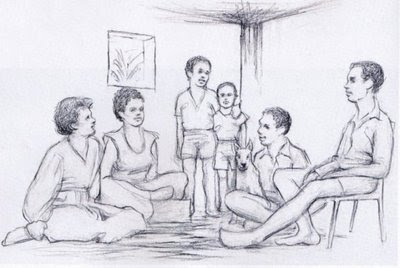 When scientists showed a similar sketch to East African people, they all assumed that the shape above the womans head was a box or metal object that she was balancing. Within a culture containing few angular visual cues, it looks as though the family are sitting under a tree. Westerner on the other hand, who are used to seeing boxlike architectural structures, interpret the picture as a family sitting indoors. They see the shape above the womans head as a window with a view of plants outside. i am from east africa and what i see it s a window.not a box. Guess The Animal Lion or a Dog? Are these lines straight and parallel?